Delighted Momma: Conch Piercings: Yeay or Nay? Conch Piercings: Yeay or Nay? So recently I cant stop thinking about getting a new piercing. I mean...that's something that's sorta temporary right? If I don't like it I just take it out and it closes up. The end and its like it never really happened. Expect for my belly button piercing that I did when I was 17. That poor thing never really returned back to normal after I had the boys. But anywho! So this is what I want to do... It's called a "conch piercing," which just might be the worst name for a piercing ever haha! So what do you think? 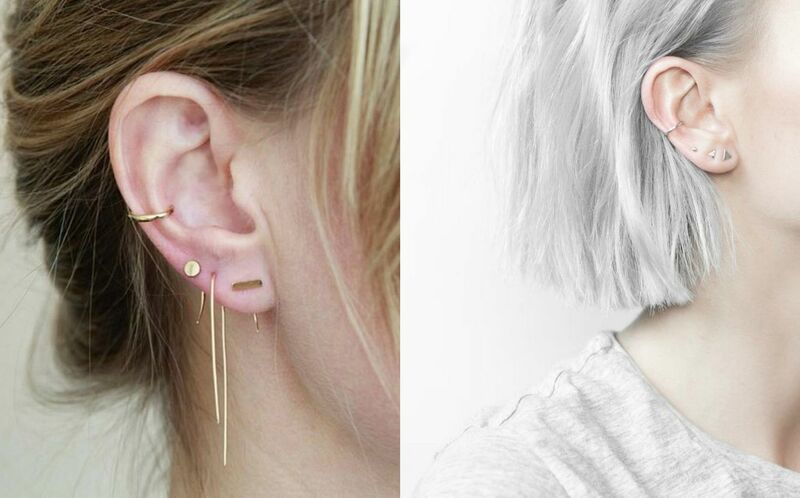 Are you yeay or nay for the not so typical ear piercings? I'm really thinking about it! They're a great piercing to get! I agree with you on the name, haha. I try to convince myself it's closer to a conch shell but that's not much better. They're very easy to heal and are low-maintenance (I've had mine for over ten years now). The only thing to be conscious of is if you sleep on that side. Sometimes mine will get a little angry if I sleep on that ear but the soreness goes away after a couple hours. Hope that helps! I love it! Yeay for sure. Love it but I've heard it's super painful! Eekk! Let us know how it goes! It's definitely cute, but I had my cartilage pierced for awhile and always got caught (either in my brush, comb or fingers) when I was doing my hair and I couldn't stand it so I eventually took it out. Might not be as much of an issue lower on the ear though. And like you said a piercing isn't a super expensive thing and can be easily undone so why not go for it if you love it! Well..... 25 years ago I did it :-) it hurt so much, lol... I also kept getting caught on everything. Mine was in the high on the cartlidge too. To this day it's still there, and I can put an earring in it --if I want--but i don't. ;-) I say --go for it Linds! Love it! You should also look into a tragus piercing, they're super cute! DO IT!!! I want to do mine ALL THE TIME but I am scared from a bad bad BAD experience when I was 18 doing my industrial. I wasn't taking good care of myself and my blood sugars were too high. and on top of all that it was a really difficult piercing to heal. It got super pissed off and I had to go to the dr. for some serious rounds of antibiotics and I almost lost part of my ear. SO. take all that with a grain of salt. You probably have your diabetes under way better control these days and you aren't a gross teenager so I think it should be safe. Also let us know how bad it hurts. Haha as I get older I am more of a wuss when it comes to tattoo and piercing pain. And I have a bunch. I like it! I wear an ear cuff I got from etsy like that, since the last piercing I got didn't heal well. It's your decision Lindsay. I'd say Nay as I think you already have a great look that doesn't need any more embellishment. I have a rook piercing that I love. It's the only one of my ear piercings that I still keep an earring in. I just don't like the conch piercing though and you can't sleep on that side of your head for months! so I vote nay. I have a conch piercing! I've had it for like 9 years now, it sucked at first if you're a side sleeper can't sleep on it at first (like any piercing) but I love mine! Funny story about its name (conch)...when I got mine I was 16 and I was st the beach I came running to my mom and said "mom I'm going to pierce my conch ok?" Her response "NO YOURE MOST CERTAINLY NOT!" I'm like "mom it's on my ear...." "Oh ok that's fine then". Lol always a funny story to me cause well her reaction was priceless! Love the look!! Please post an update if you go through with this! Such a unique design of earring. Love that so much. I wish to have this for me.